Help Me Oppo: Your'e My Only Hope. Part Deux. Picked up an 85000mi Saab 900 on monday. Nice price, but I fear crackpipe on the horizon. It has a weird smell to the interior. Yesterday, I was advised by multiple posters to try to find the source. Here is my best guess so far. Do you spot the same irritating detail? Because I was bored and wondered how hard it was to make. Tasted fine. Didn't realize what my potato had produced till I'd eaten and there was no chance for a second pic. What's oppo eating? What's up with the Subaru? We'll get to that, but first a few of my favorites. Since this topic has been done to death I tried to pick cars that don't always make the list. They get more inappropriate as we approach #1. For those who weren't on earlier. They do exist! 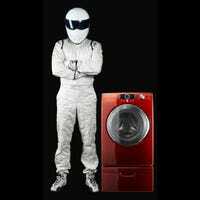 A few weeks back I wrote a humor piece comparing auto enthusiasts to a fictional guy obsessed with laundry equipment. Some enterprising internet soul sent me this picture. You be the judge. Is a picture really worth 1000 1200 words? There are some questionable practices by car dealers. I'm sure this is news to no one. In this case, however, I have to wonder. Who's at fault? Donuts and handbrake turns for all. Happy Hoon-ukka to all those who got their first snow today. First snow of the year: A gearhead holiday. What's in a name?